Whether or not people get tick-borne diseases (TBD) is related to tick population numbers (the vector), tick infection rates (the pathogen), and exposure of humans and other animals (the hosts). Understanding each of these components and their interplay is important in choosing personal protection measures against ticks as well as prevention/management of TBD. A way of estimating how many ticks occur in a given area would be of great interest to public health officials, as well as how many might actually get on a person during outdoor activities. Tick populations might be sampled and counted directly in small areas, or estimated in larger expanses by using mark-release-recapture (MRR) methods (Daniels et al. 2000, Goddard and Goddard 2008). Collection methods for these MRR studies have included dragging a white cloth around in the woods (drag cloth sampling) and/or walk-around surveys. By using these data, researchers have attempted to design ecological or entomologic risk maps or charts for Lyme disease and other TBD (Davis et al. 1984, Schulze et al. 1991, Daniels et al. 1998, Supergan and Karbowiak 2009). This pilot study attempts to link drag-cloth sampling results to the actual risk of acquiring black-legged ticks, Ixodes scapularis in central Mississippi. Background data from work in field plots. During February 2005 and 2006, two 1-ha plots were marked in the Copiah County Wildlife Management Area near Pattison, MS and adult black-legged tick, Ixodes scapularis, populations were estimated in the plots by using mark-release-recapture (MRR) methods, and analyzed with Bayesian statistics. The black-legged tick is a wintertime species and an important vector of Lyme disease. The methods and results of this work were previously reported (Goddard and Goddard 2008). Data from that study showed an estimate of 317 adult I. scapularis in Plot 1 and 280 adult ticks in Plot 2. Ticks were collected in the plots by dragging a 1-m2 flannel cloth (held outstretched by a wooden dowel) and stopping to check for ticks on the cloth every ten meters (Figure 1). In the majority (8 of 14, 57%) of sampling events, the number of ticks collected per hour hovered around 5.0 (4.8–5.3), and overall the number of ticks collected per drag cloth hour in both plots averaged 4.5. Risk of tick acquisition. To assess human risk of tick acquisition, during the same time that a collector was performing drag cloth collections, another person, dressed in white pants and with the pants legs taped down, walked around in the plots for three-minute intervals (Figures 2 and 3). The cloth surface area of pants legs was less than half that of the drag cloth (Table 1). After each three-minute interval, the pants, shoes, and socks were examined for ticks. Five separate walk-around experiments were conducted (total time 4.5 hours), one in Plot 1 and 4 in Plot 2. Figure 1. Dragging a white cloth to collect the winter-active black-legged ticks. Figure 2. White trousers with pants legs taped down for risk analysis. Figure 3. Dragging a white cloth alongside the walker to compare tick acquisition rates. Table 1. Surface area comparison between pants’ legs and drag cloth, and ratio. Estimated numbers of adult I. scapularis ticks in the plots (317/ha Plot 1 and 280/ha Plot 2) were associated with approximately 2.5 to 6.4 ticks collected per drag cloth hour, with an average of 4.5 (Table 2). The relative rate of tick acquisition during the series of walk-around experiments was 2 ticks acquired per hour in Plot 1 and 1 tick acquired per hour in Plot 2 (Table 3). This suggests that a population size of 280–317 adult I. scapularis ticks per ha translates to about 1.2 ticks getting on a person per hour while walking around in the woods. Our previous study (Goddard and Goddard 2008) showed that tick numbers estimated by drag cloth sampling might be just as reliable as population calculations employing MRR or Bayesian methodology. Therefore, it is interesting to extrapolate the number of ticks per drag cloth hour to the actual number of ticks acquired by a person walking around. Under this scenario, approximately 5 adult I. scapularis ticks collected per drag cloth hour yields a little more than 1 I. scapularis ticks getting on a person per hour of activity in the woods. Practical application of these results might include such things as park managers sampling their nature trails for ticks with a drag cloth and extrapolating those results into the risk of hikers getting ticks on them per hour of outdoor activity. Table 2. 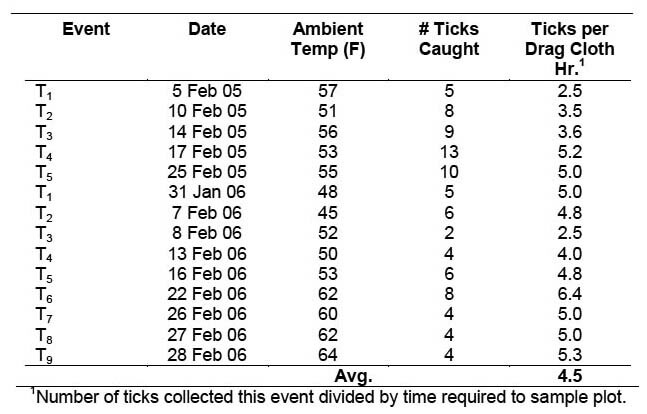 Ticks per drag cloth hour, February 2005 and 2006, Copiah County Wildlife Management Area. Daniels, T., R. Falco, and D. Fish. 2000. Estimating population size and drag sampling efficiency for the blacklegged tick. J. Med. Entomol. 37: 357-363. Daniels, T. J., T. M. Boccia, S. Varde, J. Marcus, J. Le, D. J. Bucher, R. C. Falco, and I. Schwartz. 1998. Geographic risk for Lyme disease and human granulocytic ehrlichiosis in southern New York state. Appl. Environ. Microbiol. 64: 4663-4669. Davis, J. P., W. L. Schell, T. E. Amundson, M. S. Godsey, Jr., A. Spielman, W. Burgdorfer, A. G. Barbour, M. LaVenture, and R. A. Kaslow. 1984. Lyme disease in Wisconsin: epidemiologic, clinical, serologic, and entomologic findings. Yale J. Biol. Med. 57: 685-696. Goddard, J., and J. Goddard II. 2008. Estimating populations of adult Ixodes scapularis in Mississippi using a sequential Bayesian algorithm. J. Med. Entomol. 45: 556-562. Schulze, T., R. Taylor, G. C. Taylor, and E. M. Bosler. 1991. Lyme disease: a proposed ecological index to assess areas of risk in the northeastern United States. Am. J. Pub. Hlth. 81: 714-716. Supergan, M., and G. Karbowiak. 2009. The estimation scale of endangerment with tick attacks on recreational towns areas. Przegl. Epidemiol. 63: 67-71.